Himmel Hospitality Group brought together Eventide Oyster Co. chefs and Winter Point Oyster Farm employees for dinner on Winter Point in Portland, Maine. PORTLAND, Maine — “These were in the water an hour and a half ago,” said Arlin Smith, general manager of Eventide Oyster Co. restaurant, lifting up a just-shucked littleneck clam that drips with brine in its shell and glistens in the setting sun. A long slice of marsh behind him, lit to an electric green by that same sunset, is home to oyster beds belonging to Winter Point Oyster Farm — a tiny family operation perched on this pristine swath of Mill Cove in West Bath, Maine. “Eventide has partnered with Winter Point as long as I can remember,” said Chris Himmel, thus opening up a discussion about how the James Beard award-winning seafood restaurant’s weekly orders (it has a location both in Portland and as of last year, Boston) of bivalves has almost singlehandedly kept the farm in business. What’s a little strange, though, is that Himmel doesn’t work for Eventide. Boston diners know him as the president of Himmel Hospitality Group, which includes the urbane, heavy-hitter restaurants Post 390, The Harvest, Bistro du Midi, and Grill 23 & Bar. So why, then, is he taking all this time to talk up Eventide? Because on nights like this, they all might as well work for the same place. For the third summer in a row, in a program titled “Himmel Hits the Road,” the company has spent weeks bringing its top-performing chefs, beverage directors, and managers, and servers on lengthy road trips to many of the farms they work with, and to join up and cook with other restaurants that work with those same farms. The first summer they got in an RV and spent 23 days driving, cooking, and eating their way from Washington, D.C., down through Atlanta, Florida, New Orleans, Austin, Texas, Las Vegas, and LA, ending up in Bawley, Calif. — home to one of Himmel’s most prized and longstanding family farm producers, Brandt Beef. Year two they took on the Pacific northwest, starting in Seattle, moving on to Portland, Ore., and wrapping up in Napa, Calif.
And then in Maine, there was the dinner on Winter Point. Together with the Eventide crew’s New England clam bake and platters of gleaming sashimi, Grill 23’s specialty meats will comprise a dream-team effort in what could arguably be considered the ultimate in surf ’n turf dinners. People carry dishes, pour wine, and grab plates for one other. 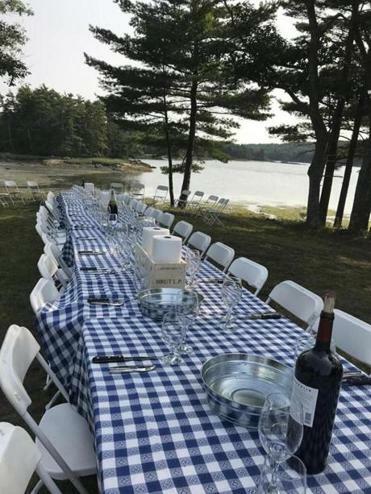 Behind them in the open field abutting the bay stretches a single long table, set for the staffs of both restaurants to sit down to dinner. Alexandra Hall can be reached at alexandrahal@gmail.com.